Our office was in desperate need of a new piece of furniture that was going to act as coffee station but also function as extra storage space. One of our team members here at Don of all Trades Professional Home Maintenance Services who also happens to be a member of the Facebook BLACK MARKET – VarageSale site, found this old solid wooden dresser and got it for a steal at just $50! As a fast, economical way to breathe new life into this old piece, we gave it 3 coats of chalk paint and we absolutely love the results. Thinking of up-cycling your tired furniture with paint and colour? Follow these easy DIY instructions for how to prep and paint wood furniture with beautiful results in just 1 weekend. Remove any removable elements like hardware, shelves, drawers. Run your hand across the piece to find any rough patches that might need sanding (but you do NOT need to sand the entire piece when using Chalk Paint–even if it’s varnished!). Fill any holes with wood glue. Even if your furniture piece appears to be clean, it will still be covered in oils from hands. So, make sure to give it a once over with some warm soapy water. we just used a mild dish-soap, followed up with a final pass of clear water, so we didn’t leave behind any soapy residue. Then, just allow ample dry time before applying your first coat of paint. Edge off any sections that won’t be painted using painter’s tape (like the inside of drawers). So what exactly is chalk paint? Chalky-finish paint is a latex-based paint to which a fine granular powder has been added—often Plaster of Paris. After the paint dries, the granules create a matte finish. Brush strokes and imperfections become part of the look, making it a forgiving finish to apply. The finish can be sanded in places to create a distressed look or waxed for either an aged look or more satin finish than paint alone. We’ve used this Rust-Oleum® Chalked Ultra Matte Paint in Linen White product on a previous project in the past and loved the results. Rust-Oleum® Chalked Ultra Matte Paint is a thicker paint that creates an ultra matte finish with superior adhesion and coverage. It rejuvenates furniture and home décor with timeless elegance. It can be painted or distressed, giving any project a one of a kind look with a vintage feel. 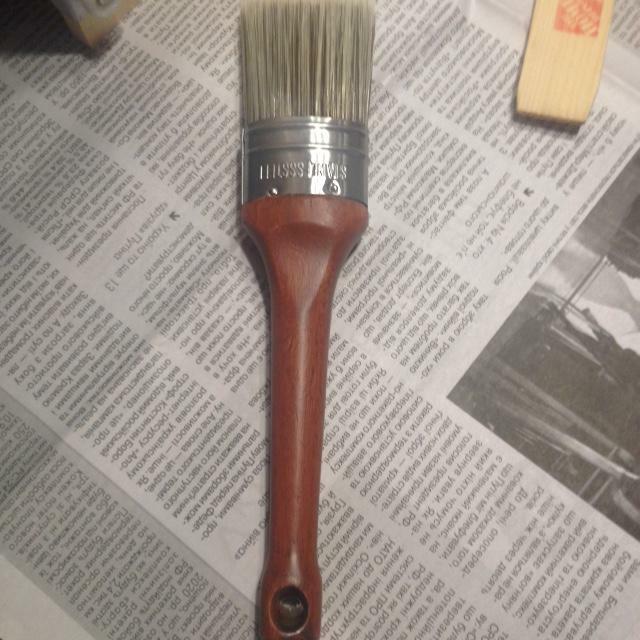 The brush that you choose is super important, as it will affect the way your paint goes on. Our favorite brushes to use are the Nour Craft 1 1/2 inch Premium Oval Brush. Keep in mind that chalk paint does show brush strokes, which is part of it’s charm, but that also means that you want to keep your brush strokes going in the same direction. It really helps if you’re painting a wood piece because you can just follow the grain of the wood. When you’re finished painting, you can clean your brushes with warm water and a mild soap. Nour Craft 1 1/2 inch Premium Oval Brush. The 1.5 inch (37mm) Premium Oval Brush is a professional polyester brush for use with all paints and wax. This brush is ideal for spreading wax because of the density and firmness of the filaments and is best suited for application on medium-sized objects. In addition, the oval shape provides greater coverage. Practice painting a scrap board before tackling a project. When layering different paint colors for a distressed finish, apply a heavier base coat than top coat. Work quickly — chalk-finish paint dries fast and immediately remove any particles in the wet paint. 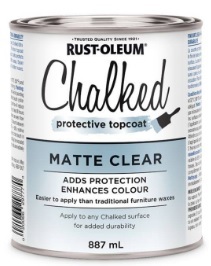 As mentioned above, Rust-Oleum® Chalked Ultra Matte Paint is quite thick, and it’s meant to show brush strokes. We found that by adding a little water to our paint makes the brush strokes a little less noticeable and makes the paint go further. If you’re going to add water, we would recommend putting a little paint in another container and adding small amounts of water at a time until you have reached your desired consistency. Also, if you’re painting from the can and the lid is left off for a good amount of time, the paint can thicken even more. In this case you can simply add a little water to the can and shake it up. Dry time was 1 hour before applying the second coat of chalk paint to this piece. Day number 2 was extremely exciting for us as this was the moment were we got a good opportunity to appreciate the benefits of painting this piece with chalk paint. 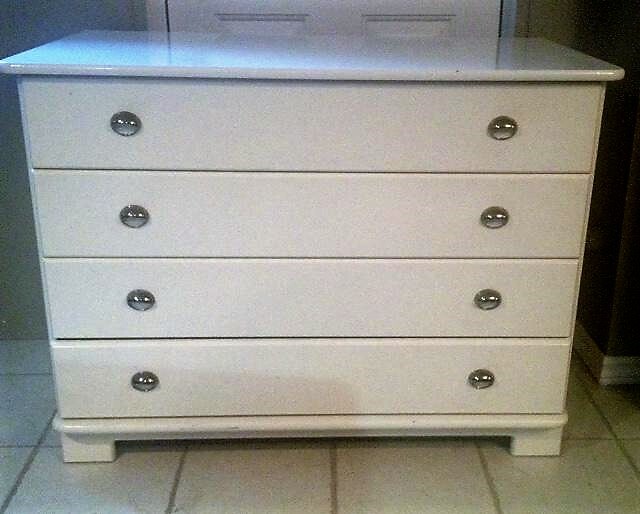 Considering this was a second hand piece that the previous owner had for years, this dresser was in truly good shape. Since this piece was being used as a coffee station, we chose the Rust-oleum Chalked Protective Top Coat Brand to add extra protection against any spills or accidents. We found that this product worked like it said it would. This is a good sealer for the chalked paint. We also wanted to mention that this product does darken the colors a bit. Over all, we are very happy with the results. So we decided to give the drawer hardware a new look by giving them a light sanding and applying Rust-Oleum® Brand Spray paint specifically designed for metal surfaces to help give them a new look and to add a little more character to the dresser drawers. Once dry, we added them to the drawers and we have to say our new coffee station is looking good! Our DIY Weekend Project-Turning An Old Dresser Into A Coffee Station is finally finished and ready to enjoy! It looks fantastic and we look forward to finding more great deals out there on line to work on in the future. Perhaps the single most beneficial aspect of chalk painting furniture is that it requires almost no prep work and no priming. Another plus is that you don’t have to be a perfect painter to do this. In fact, you are SUPPOSED to do criss-cross brush strokes and not straight lines. Anyone can do this! Have a question about your home improvement project? Get In Touch With Us. We’d Love to Hear From You! Call 905-259-5249, by email: infodonofalltrades@gmail.com or visit our website at http://www.donofalltrades.ca today! We offer a wide range of home improvement services for your home including FREE ESTIMATES in Durham Region. Call 905-259-5249 or email infodonofalltrades@gmail.com. Visit our website at: www.donofalltrades.ca to find out more!